[AUTO]:[Counter Blast (1)] When this unit is placed on (RC), if you have a vanguard with "Revenger" in its card name, you may pay the cost. If you do, choose one of your opponent's grade 1 or less rear-guards, and retire it. Just 3 cards this week? A bit disappointing. Also a belated welcome to the newcomer I suppose. 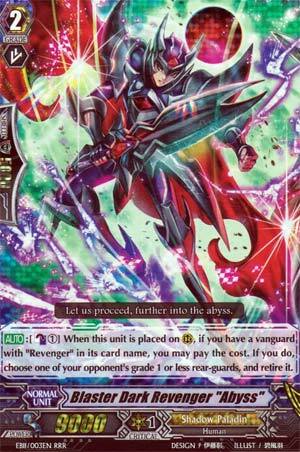 So, starting us off is Phantom Blaster Abyss's partner, Blaster Dark Revenger "Abyss". When called, you can counterblast 1 to retire a Grade 1 or below rear-guard. Simple enough skill. A +1 for CB1 is certainly efficient enough, and given attackers tend to outweigh viable boosters in almost every deck, it may turn out to be a little more meaningful since they tend to be harder to replace. Obviously meant to be a staple in the RPBA build, but could possibly have some merit teched into other builds of Revengers. A belated welcome to the new guy, I'm sure that Saikyo and I will find plenty of reasons to snipe at him as well as each other from here on out. It's Thanksgiving this week, folks, at least if you live in the U.S. Canada already had their version of this holiday a month or so ago. So, only three cards this week. Last week we looked at some Legions, now we look at the Mates. Of course, we'd have more to talk about if some of our reviewers didn't give reviews for some of these cards this week already. Anyway, Blaster Dark "Abyss" here, we know he's the mate of Phantom Blaster "Abyss", and since he's got Blaster Dark in his name, he's got to have some skill similar to the previous three versions (BD, Spirit, Revenger), so what does the new version have? When he's placed on a rear guard zone, if there's a Revenger Vanguard in play, you can CB1 to retire any grade 1 or lower rear guard your opponent has. 10K beater? Ordain Owl? Cat Butler? Starting Vanguard? Commander Laurel? 10K booster? Some other booster with a good effect that I didn't mention? All dead for one counterblast. Very efficient. Only downside is that while Legions don't care if you run mixed clans or not, some sub-clans, like the Abyssal Revengers, only really work with their sub-clan and nothing else. But, over-all, this is a nice pick-up for Revengers and a guaranteed staple for them for a long time. I should note, before I end this review, that while the name has "Blaster Dark Revenger" in its name, Blaster Dark "Abyss" will not work for the likes of Dorint. So, no free grade 1 or grade 0 retire.